A BETTER joint formula for dogs suffering from mild joint problems such as stiff joints or pain associated with exercise. 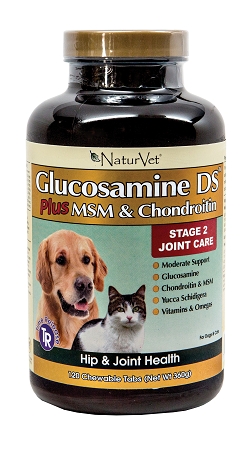 Provides the same levels of Glucosamine and Chondroitin as Glucosamine DS with the addition of MSM. MSM provides sulfur which is critical in the formation of collagen and glucosamine which are vital components for healthy bones, joints, ligaments and tendons. Recommended to support healthy hip and joint function. Helps to maintain joint flexibility and alleviate aches and pains associated with exercise.